I am so excited to share my first project of #30daysofDIY! It wasn't even a disaster! These bracelets are relatively easy to make (I did keep spilling my beads everywhere) and look just like what you would buy in the store! While I've been on a bracelet making frenzy, you can easily use this tutorial to make a necklace as well! Scroll through the instructions and get crafting! First, cut off a piece of embroidery thread about 1.5 feet long. I just measured from my fingertips to a little past my elbow (or to my shoulder for a necklace) Fold that piece in half twice and set aside. 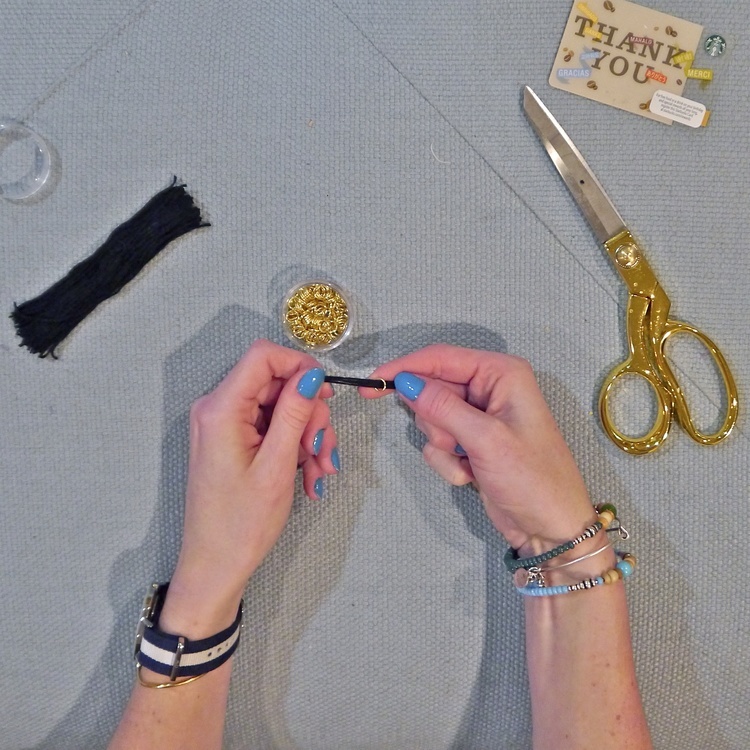 Wrap the rest of the embroidery thread around the gift/credit card (bracelet- short way, like below. necklace- long ways) Once all of the thread is wrapped, cut the thread along one edge of the card. Take the folded thread you set aside and thread it through one of your jump beads. Lay it flat on your work surface so the the jump bead is in the center of the folded thread. Lay the bundle of thread that was around the card perpendicular to the folded thread so the middle of the bundle is on top of the jump bead. Tie the folded thread around the middle of the bundle so the jump bead is on one side of the bundle and the knot is on the other. Cut the loops of the folded thread open. Don't shorten them, these threads will become part of the tassel. Fold the two sides of the thread together so the jump bead is at the top and you have something that looks like this. Take a piece of gold wire (I measured it from my wrist to my elbow) and wrap it around the folded tassel. Use your pliers to secure the wire. I do this by folding one piece up and then tucking it behind the looped wire so it comes out in the middle of the tassel. Trim the tassel so the ends are all one length. You can trim it more once it is on the bracelet. Now you have your pretty tassel! String the tassel on to one side of the bracelet. Take two crimp beads and sting both sides of the cord through each bead like below (yeah, I forgot to put the tassel on the first time). Cut a piece of your stretchy cord with extra on each side. I kept 4-6 inches extra on each side and it made it so much easier. String your colorful or not-so-colorful beads on the cord. Measure around your wrist to figure out when you have enough beads. TA DA! 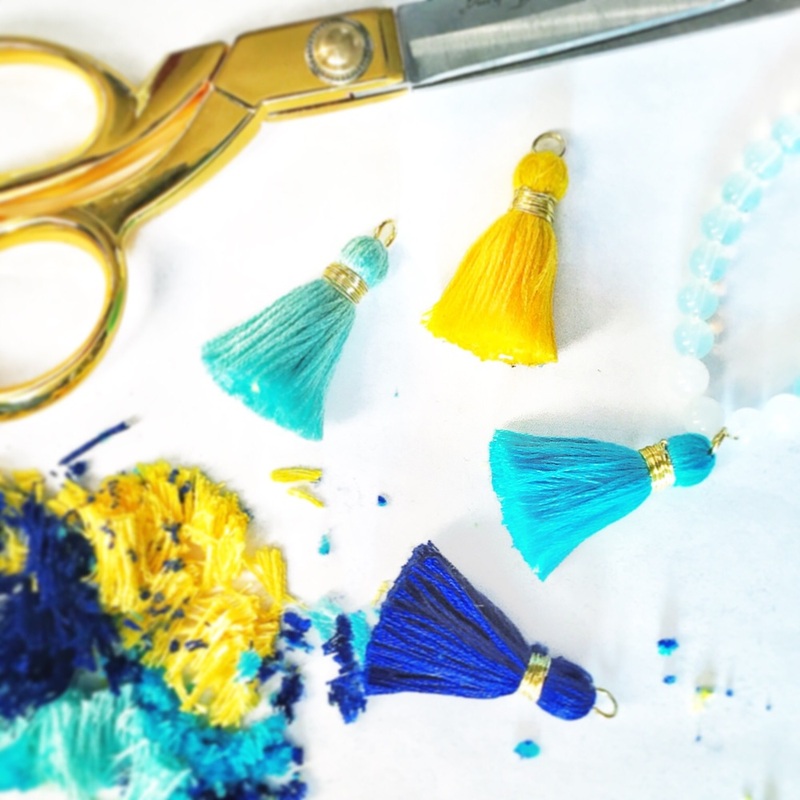 You have yourself a tassel bracelet! Check our some of my other bracelets below and scroll to the bottom to download printable instructions!